for $339,500 with 4 bedrooms and 3 full baths, 1 half bath. This 2,253 square foot home was built in 2004 on a lot size of 2253 SqFt. 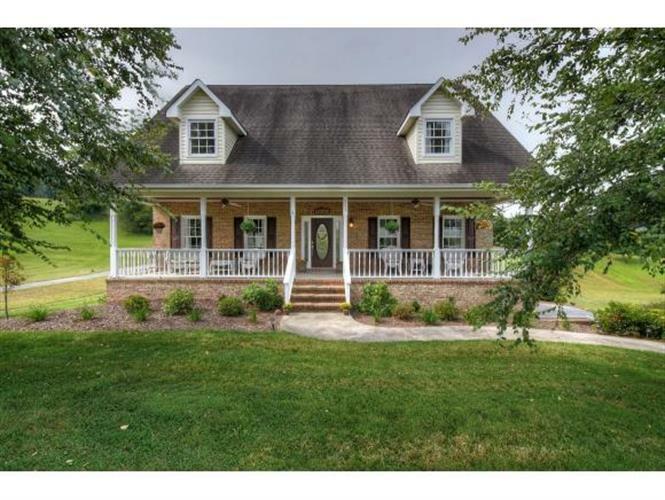 Beautiful 4 bedroom, 3.5 bath, brick Cape Cod home located in an elegant, country setting with panoramic mountain views. Conveniently located between Johnson City and Jonesborough with quick access to I-26. The front porch with it's stained pine ceiling welcomes you into an open, two story great room with gleaming hardwood floors. The dining room will handle a large table for 6-8 and is open to the kitchen and great room. The master is on the main level with 3 more bedrooms upstairs. The basement is partially finished with a den w/fireplace, bathroom and dining area w/french doors leading out to a patio area. In the backyard there is a building perfect for extra storage and/or a workshop. This home has so much to offer! Buyer / Buyer's Agent to verify all information.